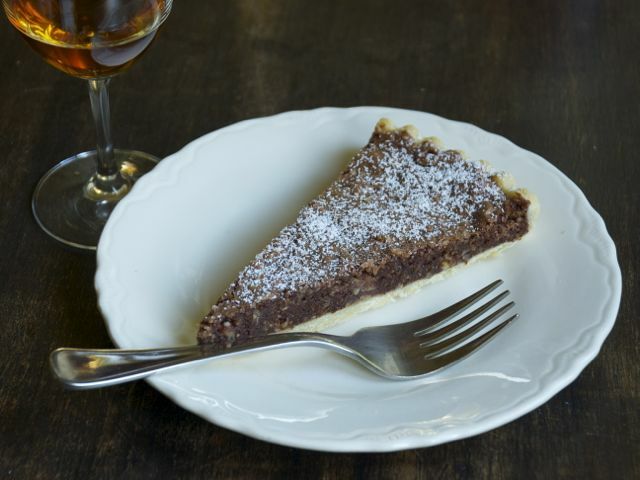 This is one of the best tarts I have ever eaten, and it is a must for all chocolate and nut lovers. Once I start to eat it, I cannot stop. Try to serve it shortly after it comes out of the oven — still slightly puffed up and warm — but you can serve it cold if you like, and even a few days later. This is lovely served warm with cream or ice cream, but just as good cold with a cup of coffee. Make the pastry: Sift the flour, salt, and confectioners' sugar into a food processor. Add the butter and process briefly until the mixture resembles fine breadcrumbs. Mix the egg yolk with the sherry. Put the crumbled mixture into a bowl, stir in the egg yolk and sherry mixture, and bring the dough together into a ball. Turn the dough out onto a lightly floured surface and knead briefly until smooth. Shape it into a flat disc, wrap it in plastic wrap, and chill for 15 minutes. Remove the pastry from the fridge and roll it out thinly on a lightly floured surface. Use it to line a round springform tart pan (10 inches in diameter, 1½ inches deep). Refrigerate again for 20 minutes. Put a baking sheet on the middle shelf of the oven and preheat the oven to 400 degrees. Line the pastry with foil and a thin layer of baking beans, and bake for 15 minutes. Remove the foil and beans and bake for another 4 to 5 minutes, until the crust is crisp and golden brown. Remove and set aside. Make the filling: Spread the hazelnuts onto a baking sheet and roast for about 8 minutes, until richly golden. Remove and allow to cool. Reduce the oven temperature to 325 degrees. Grind the nuts finely in a food processor until they resemble coarse breadcrumbs, but leave some of them a little chunky. Put the chocolate into a small heatproof bowl set over a pan of barely simmering water. Take the pan off the heat and leave until the chocolate has melted, then lift the bowl off the pan and allow the chocolate to cool. Beat the butter, sugar, and orange zest together in a bowl until light and fluffy. Beat in the eggs, one at a time, adding a little of the flour with the second egg to stop the mixture from curdling. Fold in the remaining flour, the ground hazelnuts, melted chocolate, and, lastly, the sherry. Finish the tart: Spoon the mixture into the pastry case and bake for 30 minutes, by which time it should be slightly risen and feel firm to the touch at the center. Remove and leave to cool slightly before serving. Dust with confectioners' sugar if desired.